One of the top sights in Palermo is the Norman Palace, on the western extreme of the old city center. A massive complex built in the 11th century, the palace is still used today as the seat of the Sicilian government. Tourists are allowed in, but understandably restricted to a small section. 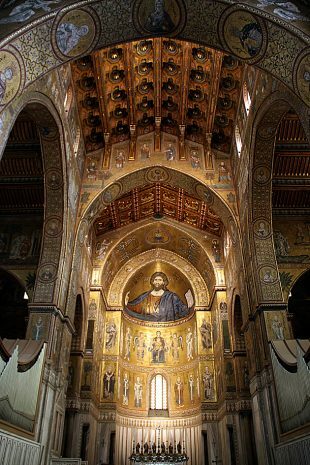 If you don’t want your jaw to smack painfully against the ground, you’d do well to wear a tight chin strap when visiting the Cathedral of Monreale. During our tour, my mouth was wide open, rivulets of drool escaping my gaping jowl. But I didn’t care, and I doubt anyone was paying attention. 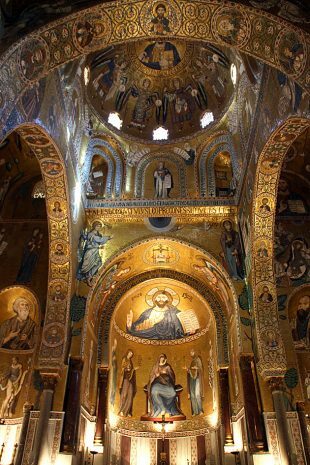 To be inside the Monreale’s cathedral and concentrate on anything other than its shimmering beauty is nearly impossible.